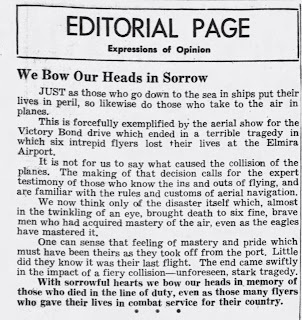 On November 5, 1945 the Wings of Victory Airmada buzzed over the city of Elmira. The fleet of ten warplanes landed at the Chemung County Airport and prepared for a three-day event celebrating the Victory Bond campaign. 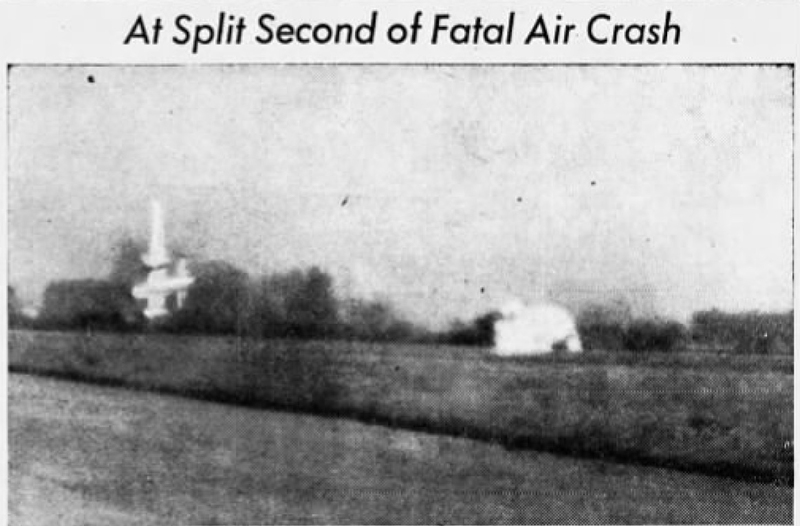 At the conclusion of the event, two airplanes collided. Both were destroyed and six men lost their lives. The Wings of Victory Airmada was a joint operation of the U.S. War and Treasury Departments following World War II. Its mission was to promote the Victory Bond campaign. It was one of several fleets touring the country. The Airmada assembled at the Rome Army Base at the end of October and flew to Rochester and Buffalo before coming to Big Flats on November 5. It was supposed to move on to Stewart Field at West Point after visiting Chemung County. Maj. Philip D. Wachtel Jr. of Truax Field, Madison, Wisconsin was Commander of the fleet of fourteen military aircrafts. Because of the length of the air field in Big Flats, only ten of the planes could land: B-17 Flying Fortress, B-25 Mitchell, A-26 Invader, P-51 Mustang, P-47 Thunderbolt, P-38 Lightning, C-46 Commando transport, C-47 Skytrain transport, AT-6 Texan trainer, and CG-10 cargo glider. The 34 members of the Airmada’s crew were assembled from eight airfields throughout the country. Most of them had served overseas and been in combat. The Airmada spent two full days on the ground at the airport, offering tours to the thousands of people who visited. 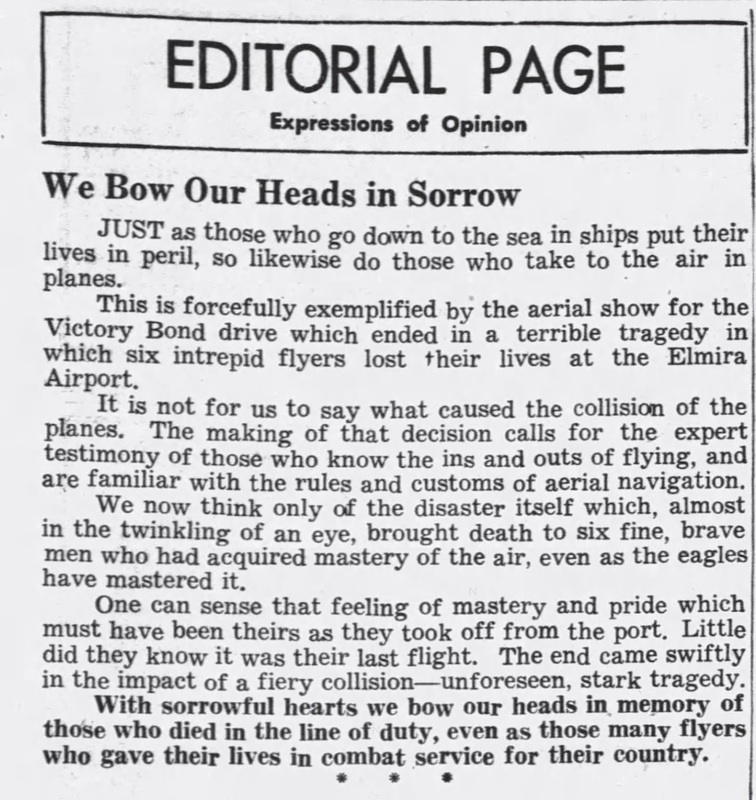 “With the lid off on military secrecy,” as a Star-Gazette reporter put it, visitors could see “many instruments and devices which put the real dent in the Axis powers.” Airmen played tour guides, opening up cargo ships and inviting people to step inside. Of particular interest was the P-38 reconnaissance ship which had five huge cameras, one in the nose, two on each side, and two beneath, to capture various views of the enemy. 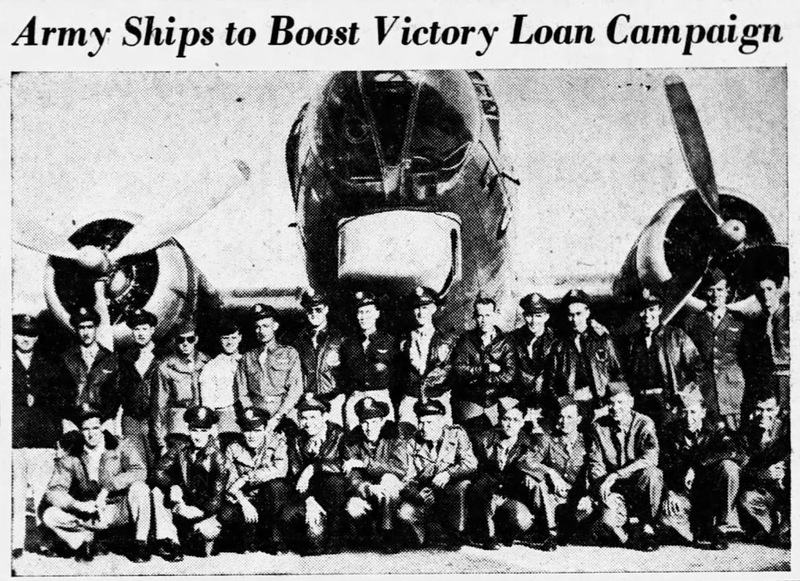 While nearly 10,000 people got to explore the airplanes, the main purpose of the Airmada was to raise money through Victory Bonds. Capt. Henry N. Hamington, pilot of the B-17 Flying Fortress, and Capt. Bedford B. Riggan, pilot of the C-47 cargo ship, spoke to a large gathering of employees at Remington Rand. 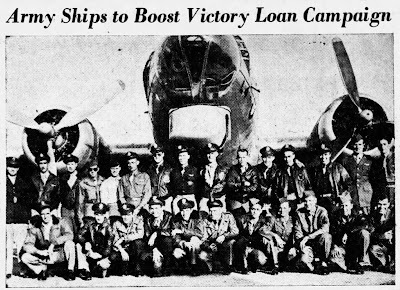 They shared battle stories and urged people to buy bonds “to clinch the peace.” The cargo glider was transformed into a Victory Bond booth on the airfield. The Minute Maids, “the trim special event sales girls,” handed out bond order blanks and signed people up for subscriptions. 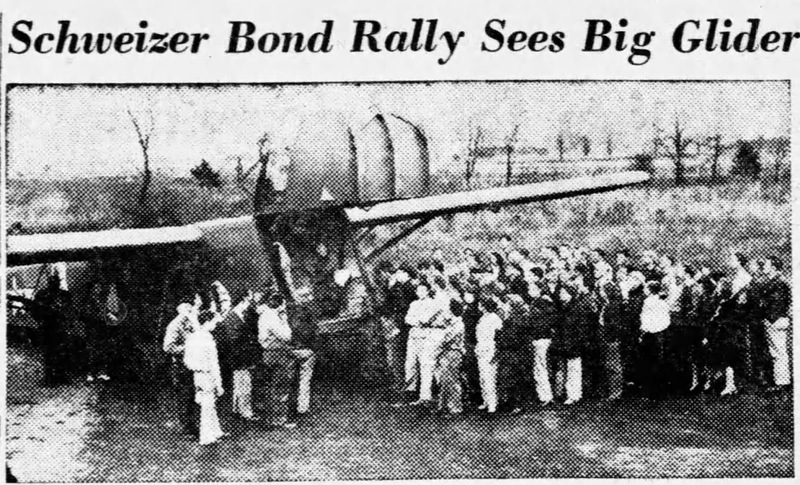 At the end of the second day of the event, the glider was towed over to Schweizer Aircraft Corp where the employees there held a bond rally around it. The Airmada had a successful fundraising visit to Chemung County. Fifty-five county businesses and countless individuals subscribed to Victory Bonds, exceeding the quota and setting the campaign well on its way to meeting its $1.3 million goal. But as the fleet was leaving on Thursday morning, November 8, tragedy struck. At around 10:30am, as the fleet was taking off to leave, the P-47 Thunderbolt fighter and the B-25 Mitchell bomber collided in midair and burst into flames. 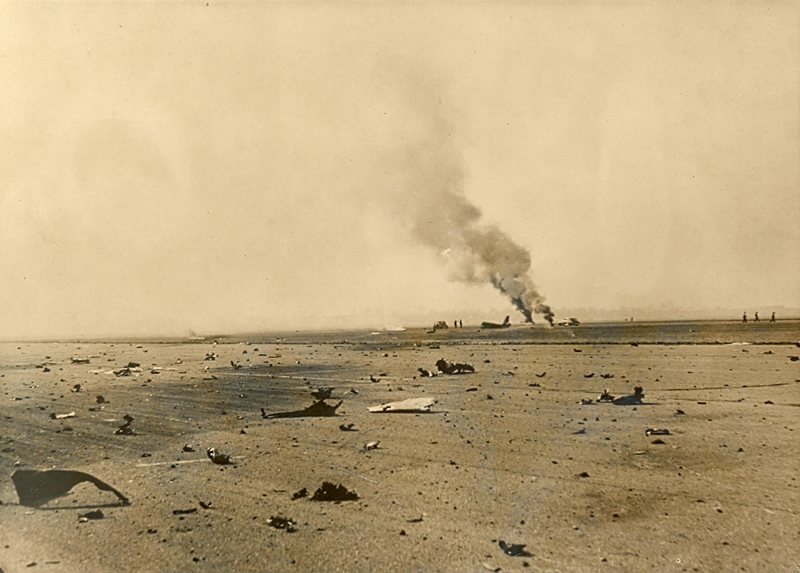 The five crewmen of the B-25 and the pilot of the P-47 were killed and debris was strewn over more than 20 acres at the north end of the airport’s north-south runway. Fortunately, the crash occurred far enough away from the nearly 100 spectators who had gathered that none were injured. Eyewitnesses told the Star-Gazette that the P-47 appeared to be trying to come into formation with the B-25 when it crashed into the bomber. An experienced combat pilot who was there did not think that the pilot of the fighter actually saw the other plane. The blunt nose and forward-set wings of the P-47 may have obstructed his view. Members of the Army Air Forces Board of Inquiry from the Rome Air Base arrived that afternoon to conduct an investigation but I never found a report in the press.